The World Series is arguably the biggest stage in professional sports. And the batters’ box of a World Series game is the epicenter of the biggest moments in post-season history. So it is only fitting that five of the Top 10 all-time post-season home run hitters went on to hit more than 500 career round-trippers, thereby qualifying for entry into the league’s most elite group: The 500 Home Run Club. 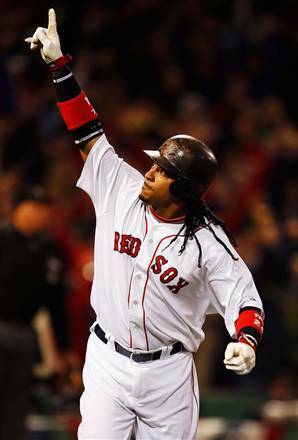 On October 13, 2007 Manny Ramirez surpassed Bernie Williams' all-time post-season homer run record with his 23rd late-summer long ball. “Man Ram” crowded the plate in the fifth inning of Game 2 of the American League Championship Series and launched an 0-2 offering from Indians reliever Rafael Perez deep to center field. The ball carried over Boston's bullpen, creating a new MLB record for postseason play. After the inning, "Manny being Manny" jogged out to left field, while his all-time playoff record was announced on the center-field scoreboard. The Fenway faithful responded with a collective roar and a standing ovation. “It feels great," Ramirez said after that game-winning long ball. "It's been a long time since I've done something special like that. But I guess when you don't feel good and you still get hits, that's when you know you are a bad man." The free-swinging, wild man has continued to prove that it’s good to be bad lead playoff caliber teams by example, while racking up a total of 29 homers in 23 playoff series with the Boston Red Sox and LA Dodgers. The greatest home run hitter in the history of World Series play was Yankee great Mickey Mantle. “The Mick” cranked out a total of 18 legendary dingers, while leading his beloved Yanks to seven World Series titles. Ruth for the most all-time). win the game for the Yankees. Babe Ruth hit 15 home runs during 10 World Series, including many heroic and memorable shots. The “Sultan of Swat” was the only player ever to hit three home runs in a World Series game on two separate occasions (Game 4 of the 1926 Series and Game 4 of the 1928 Series). But his most famous 1932 World Series homer was his 15th and final post-season bomb, the legendary “Called Shot” in the 5th inning of game three versus Chicago Cubs pitcher Charlie Root. 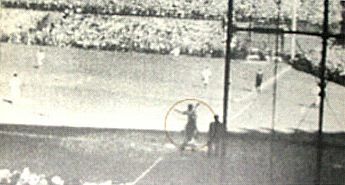 The Called Shot – Responded to the taunting of Chicago Cubs players (who stood at the top of their dugout steps and mercilessly taunted him) as well as thousand of Wrigley Field faithful, who screamed that he was a “has been” and “too old”, Ruth pointed to the center field bleachers and declaring that he would hit a home run in that direction. The Babe then proceeded to hit the very next pitch out of the park in precisely the spot where he had predicted. The mammoth long ball reportedly traveled 440 feet, making it the longest ball hit at Wrigley Field at the time. Ruth also pitched in two of the three Fall Classics in which he led the Boston Red Sox to World Series championships (1916, 1918), and he still holds the record for the longest complete game victory in World Series history. In 1916 Ruth pitched 14 innings to help the Red Sox defeat the Brooklyn Robins. He only allowed one run in the first inning, then settled down to shut out the Robins for the next 13 innings for the 2-1 win. Boston would go on to win the Series in 5 games. “Mr. October” Reggie Jackson always seemed to save his best play for autumn. Reggie had plenty of opportunity to shine in the postseason, as a member of five world champions (playing for the A's and Yankees). In 27 Fall Classic games, he hit .357 (95 points better than his regular season average) with 24 RBIs and managed to get a clutch hit virtually every time his team needed one. Frank Robinson’s powerful slugging helped his Awesome O’s of 1966 take home Baltimore’s first-ever World Series Championship, along with individual honors including the Triple Crown Championship (for leading the league in batting .316, 44 home runs, and 122 RBIs), World Series MVP and American League MVP (the first to ever win MVP honors in both leagues). As the Series got underway in Dodger Stadium, Robinson started things off for "the Birds" with a two run homer in the first and Brooks Robinson matched the effort in the next at-bat. Years later, Robinson stated that hitting a "back-to-back" homer in the World Series was his biggest thrill in baseball, even topping his induction into the Baseball Hall of Fame. “Steady Eddie” Murray secured his place in World Series history by blasting two homers in the fifth and deciding game of the 1983 Fall Classic to give his beloved O’s the title. Years later, in 1995, Murray was nearing the end of his career with Cleveland, while teammate (and eventual fellow 500 Home Run Club members “Big Jim” Thome was in just his fifth year in the bigs. After seeing his Game 2 home run go for naught, Murray won Game 3 for the Braves with an RBI single. During Game 5, Thome crushed an offering from Atlanta Braves’ pitcher Brad Clontz 436 feet, which became the eventual game-winning run. After years of disappointing post-seasons that ended before the Yankees could claim the final prize, Alex Rodriguez and his teammates finally won it all in 2009. And although A-Rod had only a single World Series home run, that’s still one more than most players get in their career. 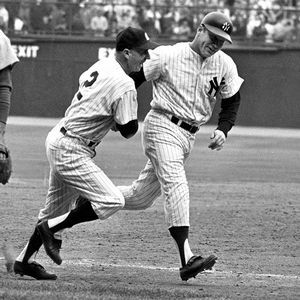 Plus, it came in spectacular fashion (after a video review) at just the right time - with the Bronx Bombers trailing 3-0 in the pivotal third game and the series knotted at one win each. After A-Rod started out the series 0-for-8, it looked like another disappointing Fall Classic for the regular season MVP. After his momentum shifting homer in the fourth inning, however, the Yankees went on to stomp the Phillies 8-5 and Alex batted 5-for-12 with six RBIs in the final four games. Unfortunately for A-Rod and his pinstripe partners, the Yankees were eliminated from the 2010 AL pennant race by the Texas Rangers. So he will just have to wait until 2011 for the chance to add more World Series home runs to his impressive list of long ball achievements.